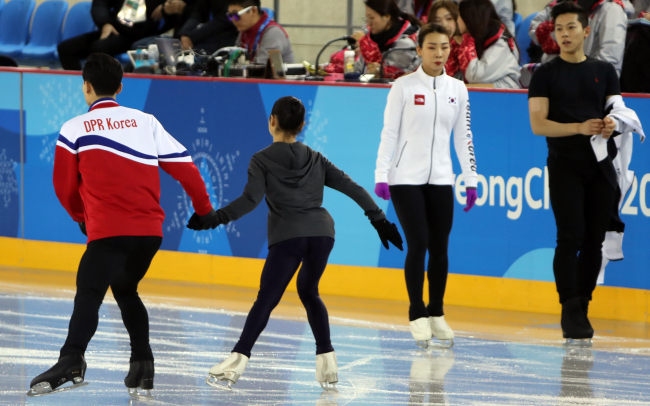 South and North Korean pair figure skaters shared the ice for the first time during a practice session at the Gangneung Ice Arena on Monday. 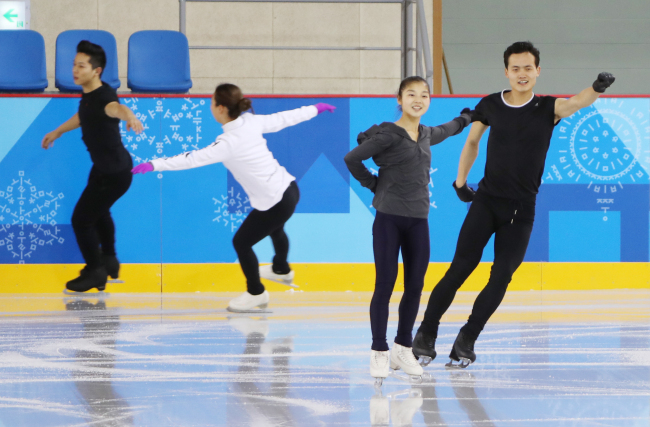 The two pairs from each half of the peninsula, Kim Kyu-eun and Kam Kang-chan from the South and Ryom Tae-ok and Kim Ju-sik from the North, practiced side by side ahead of the PyeongChang Winter Olympics, which start Friday. 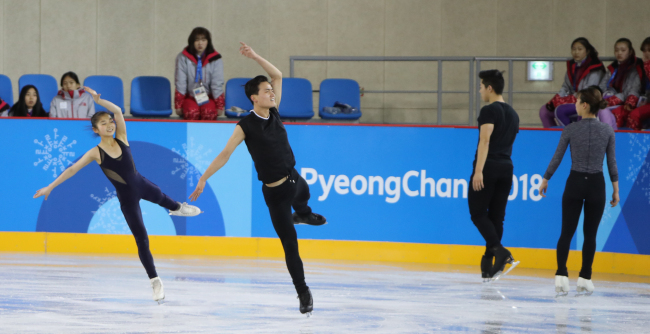 It was the first time the Kim-Kam duo practiced at the Gangneung Ice Arena. Ryom and Kim arrived in South Korea last Thursday and began training Friday. 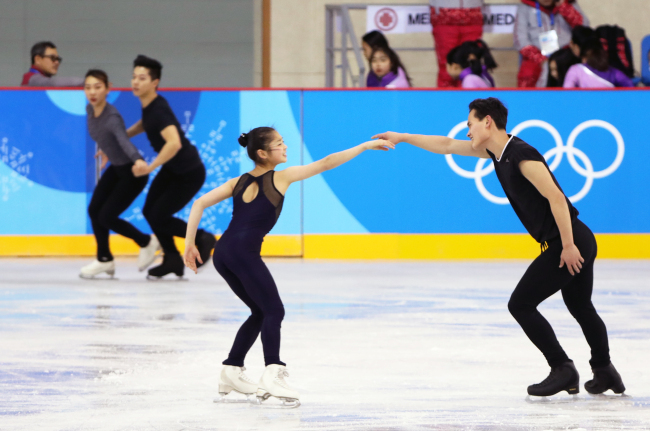 The two pairs are familiar with each other, having met at the Sapporo Asian Winter Games last February and trained together with figure skating coach Bruno Marcotte in Montreal, Canada last summer. 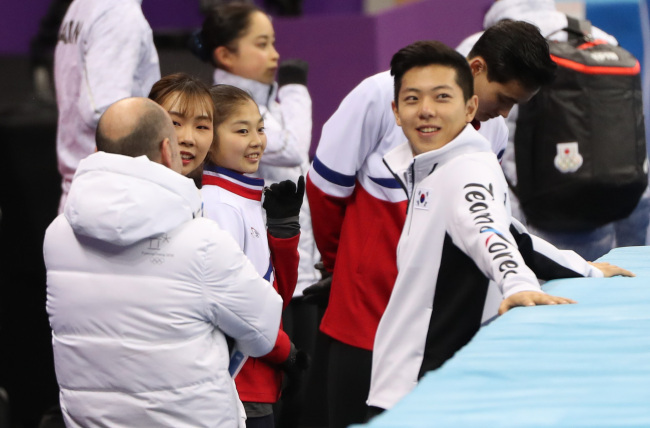 The North Korean duo looked relaxed as they smiled at the reporters surrounding the ice rink. The South’s Kam and the North’s Kim briefly locked eyes while practicing and greeted each other from afar, reports said. “We arrived at different times and didn’t have a chance to talk much (with the North’s pair). Right now, we’re focusing on training,” Kam told local media. In the foreground are the North Korean Ryom Tae-ok (left) and Kim Ju-sik pair. 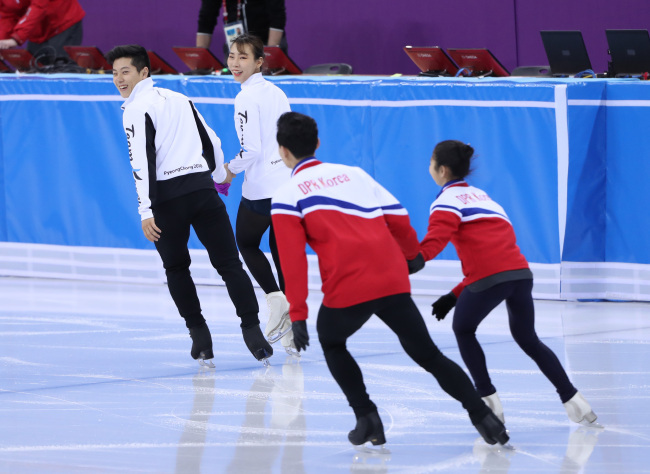 In the background are the South Korean Kim Kyu-eun (left) and Kam Kang-chan pair.